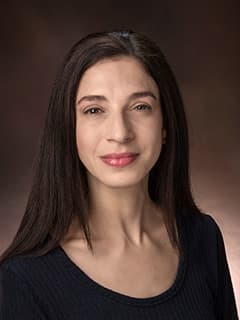 Lauren A. Beslow, MD, MSCE, FAHA, is an attending physician in the Division of Neurology at Children's Hospital of Philadelphia. Sheth KN, Petersen NH, Cheung K, Elm JJ, Hinson HE, Molyneaux BJ, Beslow LA, Sze GK, Simard JM, Kimberly WT. Long-Term Outcomes in Patients Aged ≤70 Years With Intravenous Glyburide From the Phase II GAMES-RP Study of Large Hemispheric Infarction: An Exploratory Analysis. Stroke 2018;49(6):1457-1463. Beslow LA, Dowling MM, Hassanein SMA, Lynch JK, Zafeiriou D, Sun LR, Kopyta I, Titomanlio L, Kolk A, Chan A, Biller J, Grabowski EF, Abdalla AA, Mackay MT, deVeber G; International Pediatric Stroke Study Investigators. Mortality After Pediatric Arterial Ischemic Stroke. Pediatrics 2018;141(5). Duran D, Messina RD, Beslow LA, Montejo JD, Karimy JK, Gavankar Furey C, Sheridan AD, Sze G, Yarman Y, DiLuna ML, Kahle KT. Malignant Cerebellar Edema Subsequent to Accidental Prescription Opioid Intoxication in Children. Frontiers in Neurology 2017;8:362. Beslow, LA. Stroke Diagnosis in the Pediatric Emergency Department: An Ongoing Challenge. Stroke 2017; 48(5):1132-1133. Mirsky DM, Beslow LA, Amlie-Lefond C, Krishnan P, Laughlin S, Lee S, Lehman L, Rafay M, Shaw D, Rivkin MJ, Wintermark M; International Paediatric Stroke Study Neuroimaging Consortium and the Paediatric Stroke Neuroimaging Consortium. Pathways for Neuroimaging of Childhood Stroke. Pediatric Neurology 2017;69:11-23. Uohara MY, Beslow LA, Billinghurst L, Jones BM, Kessler SK, Licht DJ, Ichord RN. I ncidence of Recurrence in Posterior Circulation Childhood Arterial Ischemic Stroke. JAMA Neurology 2017; 74(3):316-323. Billinghurst LL, Beslow LA, Abend NS, Uohara M, Jastrzab L, Licht DJ, Ichord RN. Incidence and predictors of epilepsy after pediatric arterial ischemic stroke. Neurology 2017;88(7):630-637. Grunwald Z, Beslow LA, Urday S, Vashkevich A, Ayres A, Greenberg SM, Goldstein JN, Leasure A, Shi FD, Kahle KT, Battey TW, Simard JM, Rosand J, Kimberly WT, Sheth KN. Perihematomal Edema Expansion Rates and Patient Outcomes in Deep and Lobar Intracerebral Hemorrhage. Neurocritical Care 2017;26(2):205-212. Bernard TJ, Beslow LA, Manco-Johnson MJ, Armstrong-Wells J, Boada R, Weitzenkamp D, Hollatz A, Poisson S, Amlie-Lefond C, Lo W, deVeber G, Goldenberg NA, Dowling MM, Roach ES, Fullerton HJ, Benseler SM, Jordan LC, Kirton A, Ichord RN. Inter-Rater Reliability of the CASCADE Criteria: Challenges in Classifying Arteriopathies. Stroke 2016;47(10):2443-9. Sheth KN, Elm JJ, Molyneaux BJ, Hinson H, Beslow LA, Sze GK, Ostwaldt AC, Del Zoppo GJ, Simard JM, Jacobson S, Kimberly WT. Safety and efficacy of intravenous glyburide on brain swelling after large hemispheric infarction (GAMES-RP): a randomised, double-blind, placebo-controlled phase 2 trial. Lancet Neurology 2016;15(11):1160-9. Schindler EA, Guo XM, Schrag M, Ghoshal S, Schilsky ML, Beslow LA. Neuropsychiatric Presentation of Wilson Disease in an Adolescent Male. Neuropediatrics 2016;47(5):346-7. Murthy SB, Urday S, Beslow LA, Dawson J, Lees K, Kimberly WT, Iadecola C, Kamel H, Hanley DF, Sheth KN, Ziai WC; VISTA ICH Collaborators. Rate of perihaematomal oedema expansion is associated with poor clinical outcomes in intracerebral haemorrhage. Journal of Neurology, Neurosurgery, and Psychiatry 2016;87(11):1169-1173. Adil MM, Vidal GA, Beslow LA. Clinical Outcomes among Transferred Children with Ischemic and Hemorrhagic Strokes in the Nationwide Inpatient Sample. Journal of Stroke and Cerebrovascular Diseases 2016;25(11):2594-2602. Ghoshal S, Bronen RA, McCarthy PL, Pels SG, Beslow LA. Acute Stroke in a Girl With an Absent Radial Pulse. Pediatric Neurology 2016;62:77-8. Hawks C, Jordan LC, Gindville M, Ichord RN, Licht DJ, Beslow LA. Educational Placement After Pediatric Intracerebral Hemorrhage. Pediatric Neurology 2016;61:46-50. Beslow, LA. Back to Basics-Vital Sign and Blood Glucose Abnormalities and Outcome in Childhood Arterial Ischemic Stroke. JAMA Neurology 2016;73(7):785-6. Adil MM, Vidal G, Beslow LA. Weekend Effect in Children With Stroke in the Nationwide Inpatient Sample. Stroke 2016;47(6):1436-43. Urday S, Beslow LA, Dai F, Zhang F, Battey TW, Vashkevich A, Ayres AM, Leasure AC, Selim MH, Simard JM, Rosand J, Kimberly WT, Sheth KN. Rate of Perihematomal Edema Expansion Predicts Outcome After Intracerebral Hemorrhage. Critical Care Medicine 2016;44(4):790-7. Adil MM, Beslow LA, Qureshi AI, Malik AA, Jordan LC. Hypertension is Associated With Increased Mortality in Children Hospitalized With Arterial Ischemic Stroke. Pediatric Neurology 2016;56:25-29. Sheth KN, Elm JJ, Beslow LA, Sze GK, Kimberly WT. Glyburide Advantage in Malignant Edema and Stroke (GAMES-RP) Trial: Rationale and Design. Neurocritical Care 2016;24(1):132-9. Smith D.M., Vossough A., Vorona G.A., Beslow L.A., Ichord R.N., Licht D.J. Pediatric cavernous sinus thrombosis: a case series and review of the literature. Neurology 2015;85(9):763-769. Urday S., Beslow L.A., Goldstein D.W., Vashkevich A., Ayres A.M., Battey T.W.K., Selim M.H. Kimberly W.T., Rosand J., Sheth K.N. Measurement of peri-hematomal edema in intracerebral hemorrhage. Stroke 2015;46(4):1116-1119. Adil M.M., Qureshi A.I., Beslow L.A., Malik A.A., Jordan L.C. Factors associated with increased in-hospital mortality among children with intracerebral hemorrhage. Journal of Child Neurology 2015;30(8):1024-1028. Sultan S.M., Beslow L.A., Vossough A., Elkind M.S.V., Kasner S.E. Mirsky D.M. Licht D.J. Ichord R.N. Predictive validity of severity grading for cerebral steno-occlusive arteriopathy in recurrent childhood ischemic stroke. International Journal of Stroke 2015;10(2):213-218. Sinclair A.J., Fox C.K., Ichord R.N., Almond C.S. , Bernard T.J., Beslow L.A. , Chang A.K.C., Cheungh M., deVeber G., Dowling M.M., Friedman N., Giglia T.M., Guilliams K.P., Humpl T., Licht D.J., Mackay M.T., Jordan L.C. Stroke in children with cardiac disease: report from the International Pediatric Stroke Study group symposium. Pediatric Neurology 2015;52(1):5-15. Bernard T.J., Rivkin M.J., Scholtz K., deVeber G., Kirton A., Gill J.C., Chan A.K., Hovinga C.A., Ichord R.N., Grotta J., Jordan L.C., Benedict S., Friedman N.R., Dowling M.M., Elbers J., Torres M., Sultan S., Cummings D.D., Grabowski E., McMillan H.J., Beslow L.A., Amlie-Lefond C., on behalf of the Thrombolysis in Pediatric Stroke Study. Emergence of the primary pediatric stroke center: impact of the thrombolysis in pediatric stroke (TIPS) trial. Stroke 2014;45(7):2018-2023. Urday S., Beslow L.A., Vashkevich A., Ayres A.M., Battey T.W.K., Selim M., Rosand J., Kimberly W.T., Sheth K.N..Rate of Peri-Hematomal Edema Expansion Predicts Outcome after Intracerebral Hemorrhage. American Academy of Neurology Conference 2015 (platform presentation). Urday S., Beslow L.A., Vashkevich A., Ayres A.M., Battey T.W.K., Selim M., Rosand J., Kimberly W.T., Sheth K.N. Rate of Peri-Hematomal Edema Expansion Predicts Outcome After Intracerebral Hemorrhage. International Stroke Conference 2015. Urday S., Beslow L.A., Vashkevich A., Ayres A.M., Battey T.W.K., Selim M., Rosand J., Kimberly W.T., Sheth K.N. Rate of Peri-Hematomal Edema Expansion Predicts Mortality after Intracerebral Hemorrhage. American Neurological Association 2014. Ichord R.N., Billinghurst L.L., Uohara M., Licht D., Beslow L.A. Incidence of epilepsy following neonatal arterial ischemic stroke: a prospective cohort study. Child Neurology Society 43rd Annual Meeting October 2014. Billinghurst L.L., Beslow L.A., Uohara M., Licht D. Ichord R. Incidence of epilepsy following pediatric cerebral sinovenous thrombosis: a prospective cohort study. Child Neurology Society 43rd Annual Meeting October 2014. Billinghurst L.L. Beslow L.A., Uohara M., Abend N.S., Licht D., Ichord R.N. Predictors of epilepsy after neonatal arterial ischemic stroke. Child Neurology Society 43rd Annual Meeting October 2014. Ichord R.N., Gupta N., Uohara M.Y., Billinghurst L., Licht D.J., Beslow L.A. Incidence of epilepsy following perinatal stroke: a prospective cohort study. American Academy of Neurology 66th Annual Meeting 2014. Urday S. Beslow L.A., Asuzu D.T., Vashkevich A., Ayres A.M., Battey T.W.K., Selim M., Rosand J., Kimberly W.T., Sheth K.N. Development of peri-hematomal edema measurements in intracerebral hemorrhage. American Academy of Neurology 66th Annual Meeting 2014. Malik A.M., Quereshi A.I., Quereshi Z., Beslow L.A., Jordan L.C. Transient ischemic attacks requiring hospitalization of children in the United States: Kids’ Inpatient Database 2003-2009. International Stroke Conference, American Heart Association 2014. Malik A.M., Quereshi A.I., Quereshi Z., Beslow L.A., Malik A.A., Jordan L.C. Factors associated with increased in-hospital mortality among children with intracerebral hemorrhage. International Stroke Conference, American Heart Association 2014. Beslow L. Predicting Outcome after Childhood Stroke. Presented at: Columbia University Medical Center Child Neurology Conference; 2015 Jul 17; New York, NY. Beslow L. Childhood Stroke: Outcome Predictors. Presented at: Children’s Hospital of Philadelphia Neurocritical Care Conference; 2015 Jun 26; Philadelphia, PA.
Beslow L. The Known Unknowns of Neuroimaging Markers of Outcome after Neonatal Stroke. Presented at: Children’s Hospital of Philadelphia Neuroimaging Symposium; 2014 Jun 13; Philadelphia, PA.
Beslow L. Neonatal Stroke. Presented at: Yale New Haven Children’s Hospital Neonatal Practitioner Program; 2014 May 14; New Haven, CT.
Beslow L. Neonatal Ischemic Stroke: Recovery and Repair. Presented at: American Academy of Neurology Annual Meeting course, Stroke in Childhood and Adolescence; 2014 Apr 28; Philadelphia, PA.
Beslow L. Childhood Stroke: Outcome Predictors and Measurement Tools. Presented at: Yale University School of Medicine Clinical Neuroscience Grand Rounds, Presented by the Departments of Neurology and Neurosurgery; 2014 Jan 8; New Haven, CT.